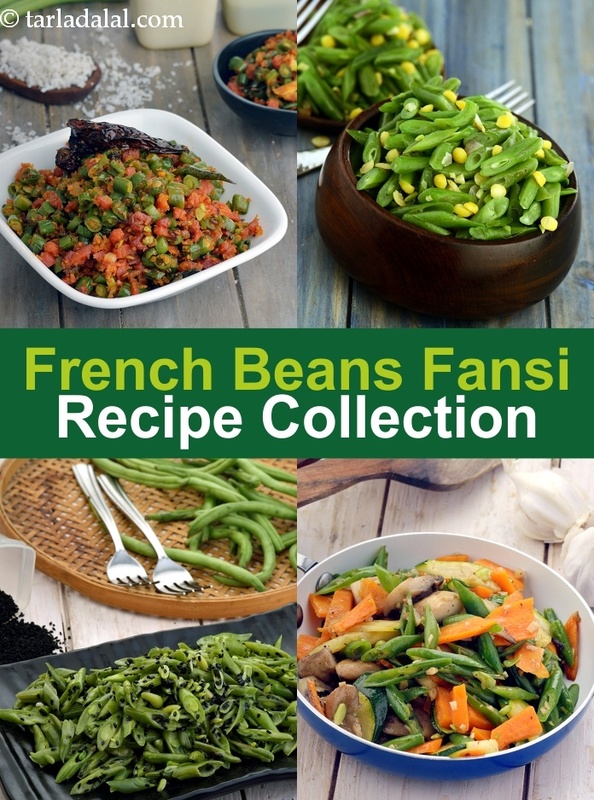 French beans recipe collection. French beans, or fansi, is a long, thin vegetable which has a velvety skin. It is very common ingredient in Indian food and in other Asian cuisines. They are slightly sweet in taste and crunchy in texture and that is what makes them so much fun to eat! They are used in subzis, rice preparations and even in snacks. French beans also play a big part in Asian cuisines like Chinese and Thai. Adding French beans in your subzi always adds an element of crunch to it and hence it is absolutely one of the most loved vegetables to put in Indian Subzis. A most famous dish, local to Gujarat and Rajasthan is Fansi Dhokli where the dhokli is made with wheat flour and besan. In the south, French beans and carrot thoran is made on the regular. It is a dry subzi, which is a traditional preparation in Tamil Nadu. French beans foogath also comes from South India and is a try preparation of fansi with coconut, coriander and chana dal. Gujarati's love to prepare their fansi in a simple, yet satisfying way by making Gajar Fansi, wherein the beans and carrots are sautéed with onions and spices. It is also an essential ingredient in the most famous Indian gravies like Vegetable kadai and mixed veg korma along with other vegetables. French beans, combined with carrots, potatoes and other vegetables in a coconut and spice based gravy creates a mouthwatering south Indian suzbi, Malabari south Indian vegetable curry. Who doesn’t love some good, deep fried snacks? Ghughra, essentially a Gujarati snack is now jazzed up with French beans to make Ghughra with fansi and paneer. Mixed vegetables open toast is a great way to make kids eat them without compromised on the taste. French beans and chana dal stir fry, a very south Indian preparation, assists those who want to eat on the healthier side. A delectable snack, which can also be served as a starter, is Schezwan fingers. Fingers are made with French beans and other crispy vegetables, deep fried and then tossed in schezwan sauce. Another simple recipe is to serve French Beans with Lemon and sea salt, which is simple, less time consuming and delicious. These are just few of the many French bean recipes for snacks. French beans make a unique addition to the soups it is added to. Chawli, French Beans and Carrot Soup is one such soup. A lentil based soup, it contains a lot of other vegetables too and is excellent for pregnant women. A similar soup is Vaal, French beans and cauliflower soup, but with added aromatics from the bay leaf. Not only can you make subzis with French beans, you can make a lot more Indian dishes. From the most basic like the Veg pulao made with rice or a Bulgur wheat pulao, French beans add a slight sweetness and crunchiness to the soft rice. The taste of French beans comes out beautifully when used with coconut and that’s why the Coconut Curry with Coconut rice tastes delectable. French beans are also used to stuff Tandoori Parathas. The Chinese love their French beans! From a simple stir fried French beans and garlic to the most classic Vegetable Fried rice, the usage is phenomenal. Indonesians also use French beans in their rice preparations, like the Gado Gado with rice which is a salad doused in peanut sauce and served with rice. A simple, yet satisfying, meal is a Spanish green bean salad called Ensalada De Ejotes with a dressing of olive oil, lime, black pepper and parsley! We hope you liked this collection of French Beans recipes. Variation of the famous south indian ' beans foogath', i've added chana dal to the dish which adds to its existing flavours.